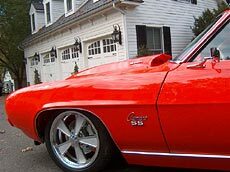 "OFF THE HOOK" 1969 Camaro RS/SS Pro-Touring "SUPER RESTOMOD" Factory 396 Car, now 502 Crate Engine Bored to 540, 4 Speed, AC, Leather Interior, Power Windows, Power Locks . . . .
1969 Camaro RS/SS "OFF THE HOOK"
1969 Chevrolet Camaro RS/SS Pro-Touring custom with vintage air!!! Featuring top shelf "HOUSE OF KOLORS -MOLLY ORANGE" paint!!! National award winning quality!!! Be the first one to take your new prize possession to a Good Guys or Super Chevy event!!! Recent rotisserie restoration!! Only 25 miles on her since completion!!! 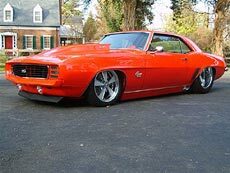 One of the most outrageous Camaro's in the world!!! This car is definitely over the top!!! 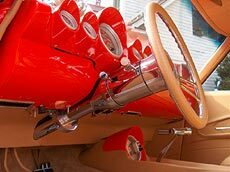 It would cost well over $300,000.00 in build cost today to duplicate this one-of-a-kind mean machine. 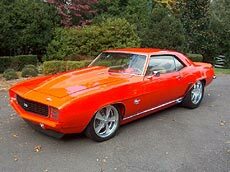 This particular car has $150,000.00 in parts alone plus 2300 hours in labor!!! 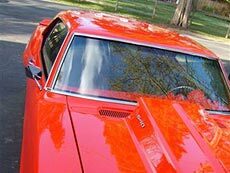 This outrageous 1969 Camaro RS/SS alias "BURN OUT", is one of the most incredible pro - touring street machines you will ever lay your eyes on. 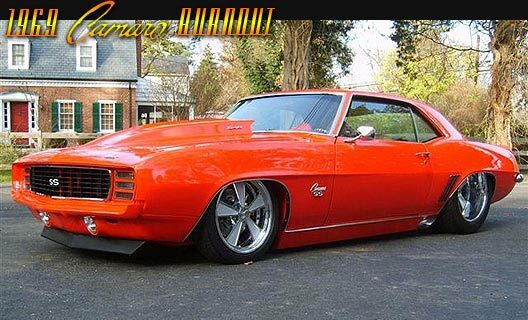 If you have been looking for a machine that takes the words "MUSCLE CAR" to another level, then look no further!!! 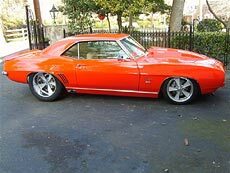 Feast your eyes on this incredible ride!! 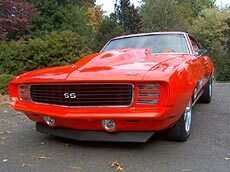 Starting with a real deal 1969 Camaro RS/SS 396, an 18 month build and using all high-end components has turned this baby into the show-stopper you see before you. 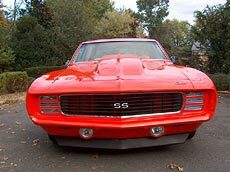 the words "SHOW QUALITY" do not do this Camaro justice and leave you unprepared for the visual assault which occurs each and every time you lay your eyes on this car!!! The heart of this 8th wonder of the world is the engine!! 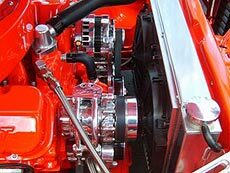 A 502 Chevrolet crate engine, bored to 540. The steel heads have been ported and polished with titanium valves installed. 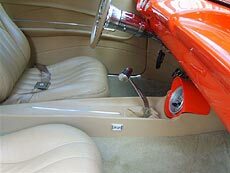 An "ISKY" roller cam & roller rockers were installed along with a 7 quart oil pan. Fuel is supplied by a "DEMON" 850 carburetor topped by a fabricated air cleaner as you have seen on many world's best customs! Fuel is supplied by a high capacity electric fuel pump along with an "MSD" ignition and "MSD" control box with rev limiter.8.5mm. The engine breathes through ceramic coated "SANDERSON" headers mated to a custom, hand fabricated 3" stainless steel exhaust. 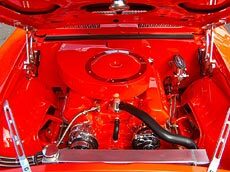 The level of detail in the engine compartment is astonishing as you can see by the pictures!! 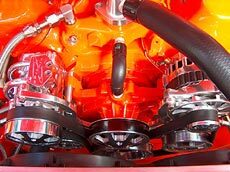 Notice the "BILLET SPECIALTIES" serpentine belt system, which includes the vintage air system which actually blows cold!!! Al hoses and lines are braided steel, with chrome fuel lines. 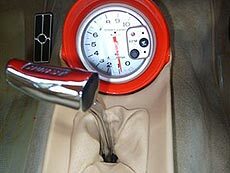 A chrome mini-starter was used as well as a chrome "IDIDIT" tilt steering column. This wild ride also has power steering for your creature comfort!! 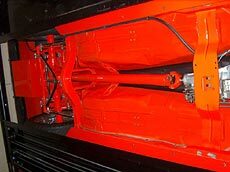 The valve covers are painted aluminum. 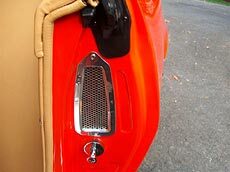 Take a look at the gas cartridge billet hood hinges and custom billet radiator support brackets. This monster stays cool thanks to a custom built heavy-duty aluminum radiator with 2 1/2" fans rated at 3000 CFM topped with an aluminum radiator cap. 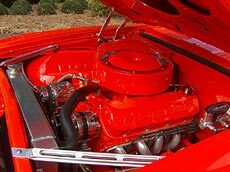 The engine when completed dynoed close to an amazing 727 HP!! This baby sports an "IMTAC" built Muncie M21rock crusher transmission with custom gears. 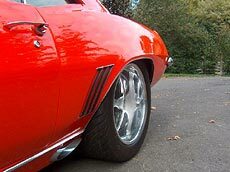 The Camaro stops on a dime thanks to a "WILLWOOD" four wheel disc system with 6 piston calipers. 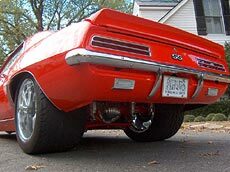 The rear end is a "DANA" 60 with "STRANGE" spool, "RICHMOND" 4.56 gear set and "MOSER" 40 spline axles. Talk about a a car that was built to be as strong as iron man! 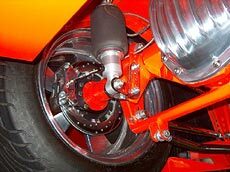 The suspension is equally impressive showing off a complete "AIR RIDE TECHNOLOGIES" system with remote control. "HYIY" Tubular A- Arms are in place as well as coil over lower arms. 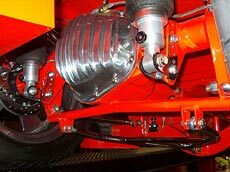 A 12 gallon fuel cell can braided steel hoses complete this incredible detailed undercarriage. Talk about stunning!!! ... Check out the hand fabricated side panels with the exhaust built into the body!!! Wow!!! 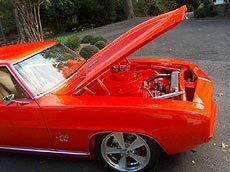 The paint is absolutely gorgeous featuring national show quality "HOUSE OF KOLOR" molly orange paint. All the tinted glass in the car is brand new and clear as it gets! The list continues... 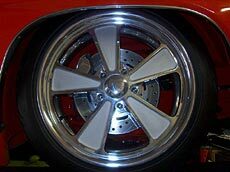 The wheel and tire combination picked for this car could not have been any better!!! 18 x 18 "INTRO" wheels up front and a whopping 20 x 16 set in the rear mounted on "MICKEY THOMPSON" S/R radials, 26 x 16 up front and 31 x 18 x 12 in the rear. The interior was custom designed and installed by "THE RECOVERY ROOM". 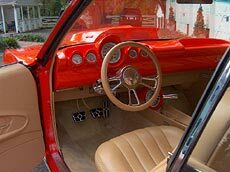 One of my favorite features on this beauty is the timeless 1959 Chevrolet Impala dash complete with molded "AUTOMATER" pro-comp ultra lite gauges. 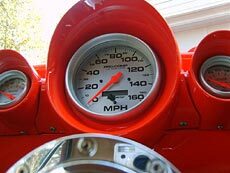 The dash is topped with a "VIN-TEC" steering wheel with a "BILLET SPECIALTIES" horn button. 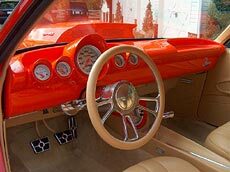 A custom leather console is present complete with an 'AUTOMETER" pro-comp ultra lite tachometer and a chrome "HURST" T handle for that old school look. 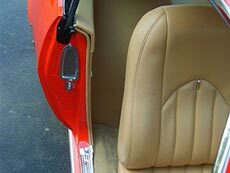 Power window buttons are tastefully incorporated into the sides of the leather console. 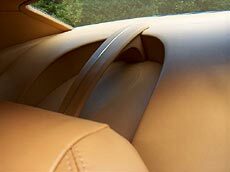 The front bucket seats, headliner, rear compartment and door panels are custom creations using imported Italian leather!!! It smells soooooooo good!!!! 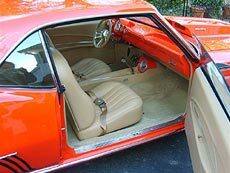 The car also features custom Chevrolet seat belts by SNAKE OYL"
TA world class custom pro-touring beauty should satisfy the pickiest judges on a national level. This car has not been featured in any magazine as of yet as it has been hiding "IN-COGNITO", while all the goodies have been meticulously installed. I can go on forever but I have to stop somewhere!!!! This car is definitely in a class all of its own!! !